Last year the desktop team here at Opera introduced Opera Next for those of you that would like to help testing new features. Today we are introducing a similar concept for Opera Mini: Opera Mini Next. 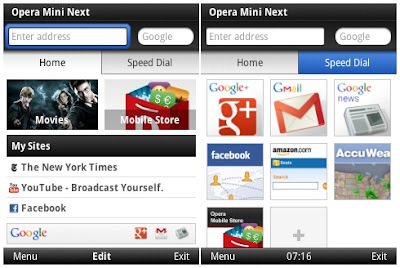 Opera Mini Next contains new features and improvements that are still under development. The purpose is to get early feedback from you so that we can improve features and fix bugs before the finale release. Opera Mini Next can be installed alongside the version you already have installed on your phone. The most visible new feature is perhaps the redesign of the start screen and the addition of Smart Page. This page gives you an overview of your favorite sites, latest updates from social networks (Facebook and Twitter), news gathered from your favorite sites (via their RSS feeds) and suggested links. Note that you can clear the Smart Page by selecting "Clear history" from the privacy settings. One common complaint has been the restrictions on the number of speed dials. We have now solved this and you can add as many as you like, or in practice as many as your device can handle. Syncing your speed dials between desktop and Opera Mini should be a much nicer experience now. Note that there are a couple of known issues when syncing with Opera Link. Speed dials may move around unexpectedly and the order can be inconsistent. We have also added a convenient way to add new speed dials: just press the star found in the address bar (touch devices only). When you exit Opera Mini with open tabs, the same tabs will be opened automatically the next time you start Opera Mini. Right-to-left text in UI elements should now be correctly drawn. We would like to fix as many of the these bugs as possible, so if you find issues, please report them. Quick access to URL/search bar by clicking on Symbian status bar (only for S60 5.0 and Symbian^3/Anna phones). Tabs can now be closed with one click on touch devices. And when you close a tab, Opera Mini will switch to the last used tab. No more "www." in address bar. The auto completion still supports it, though. Support for Russian input in Opera Virtual Keyboard (in Russian language version only). Some rendering and performance issues on Smart Page. RTL is not fully supported in input fields. Using FontZoomer to render your fonts can crash under certain circumstances. This is also an issue with the Nokia browser when visiting Hindi sites. We are communicating with them and hopefully it will be fixed on their end.